The quest to unlock the mysteries of the human brain extends back centuries, from Aristotle, who believed the brain was a secondary cooling mechanism for the heart, to Italian scientist Camillo Golgi, whose pioneering discovery in 1873 of a cell-staining technique allowed him to view the connections among brain cells for the first time. The deep intricate puzzle that is the human brain will be explored in the Brain Research through Advancing Innovative Neurotechnologies Initiative (BRAIN), which aims to revolutionize our understanding of the brain. 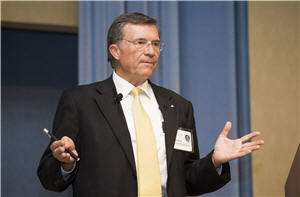 Terrence Sejnowski, PhD, one of the leading scientists instrumental in shaping that effort, recently delivered the 2014 Joseph Leiter NLM/Medical Library Association Lecture. His talk, “The BRAIN Initiative: Connecting the Dots,” provided perspective on the initiative; what we can expect in the coming decade; and the needs regarding data and data sharing. The BRAIN Initiative will gather massive amounts of data focusing on neural circuits, the part of the brain we know the least about, and then “create a map of the human brain and record enough neurons to see how they cooperate with each other” so that researchers can begin to understand how an individual brain works. Sejnowski illustrated his remarks with several dramatic videos, including one that graphically detailed the workings of a single hippocampus cell. “That’s never been seen by anyone until we reconstructed it,” he said. He also showed photos of zebrafish, used in research labs. Because they are transparent at birth, researchers can observe how the zebrafish’s brain develops. Sejnowski’s photos showed neurons switching on and off when stimulated by the zebrafish’s thought processes. 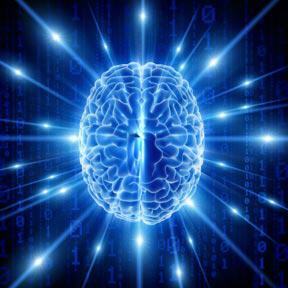 “The human brain was designed to interact with the world,” said Sejnowski. How do we study that interaction? How do we decode what we see when a zebrafish flashes neurons on and off? How do we peer into the brain and see how neurons are developing? According to Sejnowski, the future of neuro research lies with big data analysis and sensor technology that will allow electronic probing of the brain. To map the brain’s circuits, researchers need to accumulate large datasets and save them in a common format for open access by the entire scientific community access. Larger amounts of data will lead to better analysis of the brain’s complexities. To build these mega-databases, data sharing is needed, an idea that sometimes runs counter to practice in the scientific community. Such data sharing and advanced tools will lead to a “golden age of neuroscience,” Sejnowski predicted. ”Every single type of data that neuroscientists collect ranging from electrical and chemical activity; how things are connected; genetic data; behavioral data, all of those are very different in terms of the demands they make in terms of how you are going curate them and make them available,” he said. Taking the long view, Sejnowski said the golden age of neurotechnology will be comparable to other historic breakthroughs, like putting a man on the moon in the 1960s, or the biotech advances in the War on Cancer of the 1970s, and the vast genomic strides emanating from the Human Genome Project. “We need to inspire a generation of students to go into neuroscience to understand what is happening in our brains when we make decisions. We are only going to be able to do that if we can marshal the best we have in the US. And I think that’s what NIH has done with the BRAIN Initiative,” Sejnowski concluded. Editor’s Note: The Joseph Leiter NLM/MLA Lecture was established in 1983 to stimulate intellectual liaison between the MLA and the NLM. Leiter was a major contributor in cancer research at the National Cancer Institute and a leader at NLM as a champion of medical librarians and an informatics pioneer. He served as NLM Associate Director for Library Operations from 1965 to 1983.